Q. What's this mod all about? A. It's pretty simple. Hoppers can't transport items upwards. 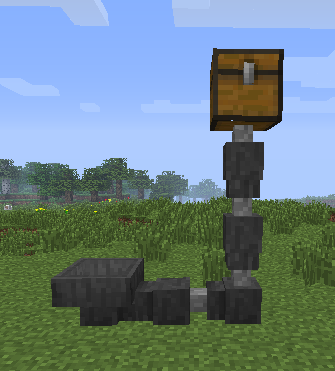 This mod adds ducts, which can attach to hoppers and send items in any direction. 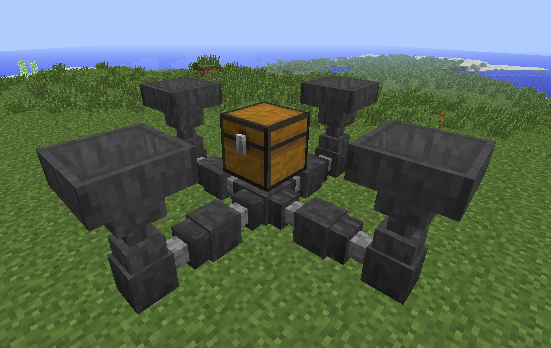 This mod also now adds Grated Hoppers, which can filter items. Q. What's the difference between a hopper and a duct? Ducts can send items into inventories above them. Ducts won't pull items from inventories above them. Ducts only have a single inventory slot. Ducts can be pointed in a different direction after placing them by hitting them with a stick. Left-clicking with the stick cycles through all possible directions, right-clicking with it cycles in reverse. You can also shift-left-click with the stick to reverse if you prefer. When in creative mode, however, only right-clicking will be available, as left-click breaks blocks. Ducts auto-orient to adjacent ducts or hoppers. Hold the sneak key while placing to disable this behavior. Ducts have smaller hitboxes, making it easier to reach blocks behind them. Q. Then what's a Grated Hopper do? A. Grated Hoppers contain an extra row of items in their interface. This is the filter inventory. Only items matching this row are allowed into the hopper from a chest, hopper, or duct above it. The Grated Hopper will also only eject these particular items into its destination. Finally, it prevents a hopper beneath it from removing items matching the filter. Items can still be inserted into the Grated Hopper from the sides and bottom which do not match the filter. This means that you can insert anything into a Grated Hopper, have it eject its matching items into its destination inventory, and then have regular hopper or Grated Hopper beneath it, pulling out the items which don't match the filter, to be directed elsewhere. Q. What are the crafting recipes? Q. What do I need to run it? A. You'll need at least Minecraft 1.6.2 with Forge 804 or greater. It uses SRG, so it will possibly work on future versions of Minecraft as well. It's tested to work with 1.6.4. Due to requests, this mod has also been backported to 1.5.2. That version was built using Forge 738. Note that versions for 1.5.2 may not be up to date with the latest release for 1.6.x. Unfortunally it is still broken, hopper still pulls in items that's not in the filter row and eventually clogging the hopper. This mod is so beautiful it brings a tear to my eye. I'd been having thoughts that minecraft needed a way to filter items and move items "up". This answers both of my problems. Now I don't have to learn to code MineCraft mods. Thanks. Great job. In previous versions if you had a hopper line that carried your items along with grated hoppers underneath each hopper filtering certain items into chests it worked as a sorter, but now all items are pulled out the first hopper into the grated hopper ignoring filter items, items matching the filter are put in the chest but the rest are stuck in the top slots of the first grated hopper. Hope Ive explained that a bit better, Ive a pic but it wont show up. I don't believe there's been a change in the grated hopper logic though, unless I'm misunderstanding you. They won't pull items from the above grated hopper if the above one has the appropriate filter item, but it will pull out any unwanted items into the lower grated hopper. That way you can filter all items downwards to various grated hoppers until they reach one which may have a matching filter, or ultimately to a regular hopper to go into an unsorted chest or whatever. As has been mentioned by a few other people, Grated Hoppers don't appear to want to send their items into any non-Vanilla inventory. I've tried Botania's Open Crate and Extra Util's mini chest and they won't drop items onto Immersive Engineering conveyor belts like vanilla hoppers do. (The easiest workaround is to stick another vanilla hopper under the grated one.) I'm playing in 1.10 (Sky Factory 3) and using them because the Presser from Pam's Harvestcraft isn't properly sided - a vanilla hopper pulls out of the input slots as well as the output. That's strange, I've tried it in my 1.10 test world with mods like Progressive Automation and I can dump stuff from a grated hopper into the machines. 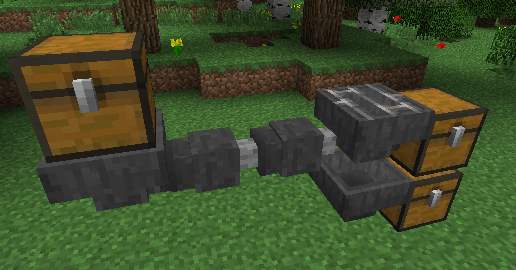 The conveyor belts may be specifically coded to work with vanilla hoppers though, I dunno. Are you planning on making hoppers upgradable to pull more items faster or even stacks of items? I would really like to see this not even with just the normal hopper but maybe with a different hopper. You're welcome! I hate that it took so long. 1.11 isn't making anyone's life easier with the internal changes, especially when one is busy with other things. Some kind of flow control, like a one way duct for a network of ducts. A splitter duct? It is easy to get the ducts to gather inputs from multiple sources..oh say a hopper lol, but not in reverse. there is no way to have a duct output to multiple chests, or furnaces. A possible solution for the latter which I've seen people implement is outputting into a double chest, then having two hoppers below that. A useful mod. However I can not put a rail or redstone on it, like a classic hopper. Is this a bug? Or is that what you want? I think you used to be able to do it originally, that must have changed over time and I never realized. Is it possible a 1.11 version? Wanting to make video review with the best 1.11 mods! Any chance for getting a 1.11 or 1.11.2 version of this mod? Nevermind, I got the Grated Hopper to work as I wanted.